Internationally acclaimed pianist Jeffrey Siegel has been soloist with the world's great orchestras. Abroad, these have included the Berlin Philharmonic, London Symphony, Philharmonic and Philharmonia, Moscow State Symphony, Munich's Bayerischer Rundfunk, the Amsterdam, Oslo and Stockholm Philharmonic Orchestras, Orchestra of La Scala and NHK Symphony of Japan. In the United States, engagements have included the New York Philharmonic, Los Angeles Philharmonic, The Philadelphia Orchestra, The Cleveland Orchestra, Boston Symphony Orchestra and Chicago Symphony Orchestra. Mr. Siegel has collaborated with many of the pre-eminent conductors of our time: Claudio Abbado, Pierre Boulez, Charles Dutoit, Neeme Järvi, James Levine, Lorin Maazel, Zubin Mehta, Leonard Slatkin, Michael Tilson Thomas and David Zinman, as well as legendary maestros of the past, including Eugene Ormandy, Sir George Solti, William Steinberg, Klaus Tennstedt and Yevgeny Svetlanov. In addition to his solo appearances, Jeffrey Siegel presents Keyboard Conversations®, a brilliantly polished concert-with-commentary format in which lively, captivating remarks precede virtuoso performances of piano masterpieces. The concert concludes with a fast-paced Q & A. New listeners discover an informal, entertaining and instantly accessible introduction to the magnificent piano repertoire. Seasoned music lovers enjoy an enriched, more focused listening experience. Ongoing series of Keyboard Conversations flourish in major cities throughout the United States, including New York, Chicago, Philadelphia, Cleveland, Phoenix, Minneapolis/St. Paul, Dallas, Denver and Washington, DC. Some of these venues have been presenting Keyboard Conversations® for more than thirty years - resounding testimony to Jeffrey Siegel's superb artistry, innovative format and loyal fans. In 2013-14, Keyboard Conversations continue for the fourth season at London's dynamic, newest arts complex, Kings Place. 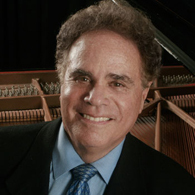 Mr. Siegel has also recorded The Power and Passion of Beethoven; The Romanticism of the Russian Soul; The Romance of the Piano (Random House Audio Publishing Group); An American Salute; Music for the Young - and the Young at Heart(WFMT Radio, Chicago); and American Pianistic Treasures (WEDU, Tampa). Jeffrey Siegel's recording of Gershwin's complete works for piano and orchestra, with Leonard Slatkin and the Saint Louis Symphony, continues to be a best seller and is available on Amazon. Mr. Siegel has appeared on Oprah Radio's "Dr. Oz Show" as guest of host and heart surgeon Dr. Mehmet Oz and author and co-host Dr. Michael Roizen. In addition, he has been a frequent guest on the popular BBC program "In Tune" in London. Keyboard Conversations® ~ Piano Treasures, a one-hour, PBS special produced by Time Life, was recently broadcast to more than 150 cities nationwide and is now available on DVD. New CD releases include The Romantic Music of Chopin, as well as The Miracle of Mozart, recorded live in London. Born into a musical family, Jeffrey Siegel studied with Rudolf Ganz in his native Chicago, with the legendary Rosina Lhévinne at The Juilliard School and, as a Fulbright Scholar, with Ilona Kabos in London. Mr. Siegel and his wife live in New York City and are the parents of two grown children.